CLAXTON -- In its 45th year, the festival formerly known as the Claxton Rattlesnake Roundup is undergoing something of a midlife transformation. The Evans County Wildlife Club, which has played host to the event since 1968, recently announced that the Annual Claxton Rattlesnake and Wildlife Festival is set for March 10-11. Fully owning its heritage but dropping the word "roundup," the event no longer will include the buying and selling of snakes for competition and prizes. A group of four wildlife and environmental groups that lobbied for years to stop the roundup aspect of the event praised festival officials for their decision. 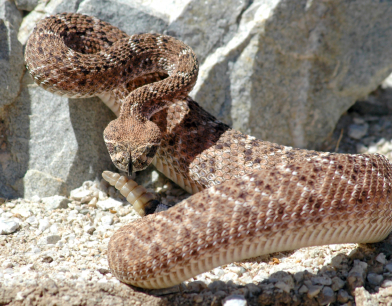 "We're so happy the rattlesnake roundup in Claxton is being switched to a humane event that celebrates these great native animals and recognizes the importance of saving them," said Collette Adkins Giese, an attorney at the Center for Biological Diversity — a group that works to protect rare and vanishing reptiles and amphibians. All other elements of the festival — a parade, a pageant, a footrace, a two-day arts and crafts show, live musical entertainment — would be retained, said Wildlife Club President Bruce Purcell. He emphasized that rattlesnakes and snakes of other species still would be exhibited live. "We want to shift gears from a rattlesnake roundup where everybody came to see rattlesnakes to a wildlife festival where we're promoting wildlife and educating people about wildlife and the conservation of wildlife," Purcell said. "I think we can open this event up and the possibilities for our promoting and protecting wildlife are endless." Other attractions that enhance the festival as a venue for wildlife education are being expanded, Purcell said. Among these are flight shows featuring bald eagles and other birds of prey from Georgia Southern University's Wildlife Education Center, "Let's Get Wild" shows put on by independent wildlife educator Steve Scruggs, and the Southeast Spring Classic Turkey Calling Contest, sanctioned by the National Wild Turkey Federation annually in conjunction with the festival. Additionally, new exhibits of snakes, fish and other wildlife are being developed in cooperation with the Georgia Department of Natural Resources (DNR). But Purcell said rattlesnakes would remain the stars of the show. Last year, just seven hunters brought in about 100 snakes, Purcell said. The snakes were sold to an out-of-state buyer. 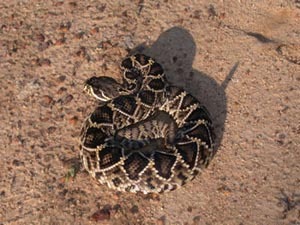 With this element of the festival eliminated, Purcell said, eastern diamondback rattlesnakes instead would be exhibited in about equal numbers through exhibits obtained in cooperation with the DNR. "As far as the public is concerned, we'll still have plenty of snakes to come look at. We're going to have rattlesnakes," Purcell said. "We simply have stopped buying and selling snakes." The rattlesnake roundup began in 1968. Due to snake hunters dwindling and a move toward wildlife education and conservation, the Wildlife Club board unanimously voted to drop the buying and selling of rattlesnakes. "We're not in a position to make them go one way or the other, but we certainly support the direction they're going," said DNR Commissioner Mark Williams. "We think it's a good thing, and we're going to help them out any way we can." Steve Hein, director of the Center for Wildlife Education at Georgia Southern University, also expressed support for the Rattlesnake & Wildlife Festival's new direction. Last year, for the first time, Hein and other staff members brought flight shows of the bald eagle named Freedom and other birds to the festival auditorium. "I applaud the Evans County Wildlife Club," Hein said. "I will point out that in their (club) constitution, conservation and education have always been the mainstays, so this is not a fundamental shift in philosophy, but rather in practice." He said Freedom and other birds from the university's collection would be back this year. The festival will maintain a stance friendly to lawful hunting and fishing as essential for wildlife conservation, Purcell said. Organizers, he added, hope to reach out to other groups such as the Ogeechee Riverkeeper and the Georgia Wildlife Federation to augment the exhibits. The festival is the largest annual event for Claxton and Evans County. Last year's festival drew about 18,000 people, and Purcell said he hopes this year's will top 20,000. The club contributes proceeds to various charities, funds scholarships for local high school students, and makes its building, pavilions and grounds available for other community events throughout the year. Copyright © 2012 Statesboro Publishing.